• Inert Ingredients: Sodium Chloride (NaCl) 1.7%, Purified Water (H2O) q. s.
Indications for Renal Use: Mechanical cleansing, debridement and removal of foreign material from ALL CATHETER EXIT SITES. Safe: Non sensitizing, non allergenic, reduces irritation. Compatible: Can be used with all catheters currently on the market. Versatile: Can be used on the skin anywhere antimicrobial action is needed. Stable: For 180 days once opened. Patient should don a face mask. Staff member should wash hands and use appropriate PPE. Place under pad under the catheter. Open sterile field onto a newly cleaned surface or chux sheet. Carefully open 2x2, 4x4 gauze pads and dressing onto sterile field. Staff should put on clean non sterile gloves. Carefully remove old dressing from the catheter site and discard. Assess exit site according to clinic protocol. • Staff should wash hands and put on sterile gloves before cleaning exit site. Take one of the ExSept Plus saturated 4x4 gauze pad and clean exit site starting at the center and move in a circular motion outwards to a radius of at least 2 inches from the exit site. Repeat with the second ExSept Plus saturated 4x4 gauze pad. Wait two minutes for site to dry. Place sterile 2x2 gauze pad over the exit site, then place the dressing taking care not to kink the catheter. Have the patient wash their access site prior to sitting in the dialysis chair. Staff member should wash hands and use appropriate PPE. On a clean chux sheet or under pad carefully open both packages of sterile 2x2 gauze pads keeping pads on sterile wrappers. Saturate both sets of 2x2 gauze pads with ample amounts of ExSept Plus (3 - 5 ml). Put on clean non sterile gloves. Take one saturated ExSept Plus 2x2 gauze pad and clean the exit site starting at the center and moving in a continuous circular motion outwards to a radius of at least 2 inches covering the insertion site. Take the second ExSept Plus saturated 2x2 gauze pad and clean the venous site starting at the center and moving in a circular motion outwards to a radius of at least 2 inches covering the insertion site. Wait 2 minutes before cannulating. Initiate dialysis treatment as per clinic protocol. Staff should put on non sterile gloves, and assist the patient with placing a sterile under pad beneath their catheter. Open sterile field onto newly cleaned surface or chux sheet. Carefully open 4x4 gauze pads, cotton swabs and dressing onto sterile field. 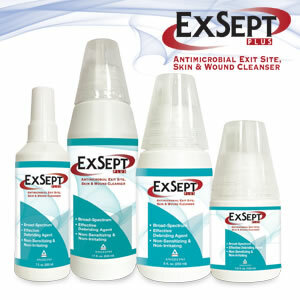 Saturate 4x4 gauze pads and cotton swabs with ample amounts of ExSept Plus (8 - 12 ml). Remove non sterile gloves, wash hands, and put on new sterile gloves. Using sterile cotton swab, remove dried blood and exudates from the exit site. Discard old swab and use new swab to repeat until exit site is clean. Take (1) one ExSept Plus saturated 4x4 gauze pad and clean the exit site starting at the center and moving in a circular motion outwards to a radius of at least 2 inches from the exit site. Repeat with a new ExSept Plus saturated 4x4 gauze pad until the site is clean. ExSept Plus must remain on the skin for 2 minutes before applying dressing. Carefully apply dressing according to clinic protocol. 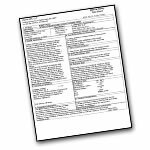 ExSept Plus Material Safety Data Sheets (MSDS) include information concerning; Generic Product Identification, Health hazard data, Hazardous ingredients, Preparation information, Special protection and precautions, Spill or leak procedures, Fire and explosion data, Ractive data, Physical data and Disposal considerations.